Describe why you entered into discernment for the priesthood or when you heard the call from God. I was raised Catholic, but drifted from prayer and Mass during college at Penn State. I fell in love and got married during my senior year. We were blessed with a son. Although we were hopeful, the marriage ended in divorce in 1990, and was annulled. I never wanted to be divorced. This would be a time of conversion and reawakening for me. I decided to not date and remained open to reconciliation. I devoted myself to being a good father to my son, Jimmy, and I knew that I needed the Lord to do this. I began attending daily Mass and regular confession. Within a couple years, I began to teach CCD, served as an Extraordinary Minister of Holy Communion and was active in the Cursillo movement. Teaching and sharing my Catholic faith in Christ brought great happiness. I began to feel the call to do something full time in the Church. At first, I thought that might be the diaconate. But as my son grew up, I received encouragement from friends, both lay and clergy, to consider the priesthood. I had been having conversation with the director of vocations, who was very encouraging and supportive. During this time, I pursued a master of arts degree in theology from the Augustine Institute at night. During the day, I was co-owner of J2 Tech, a small IT business in Allentown. In 2013 we were approached by a large company interested in acquiring the business. This was an important “shove” to me in making the step to apply to the seminary. Throughout the process, my son remained my primary concern. Now that Jimmy had graduated college and was self-sufficient, I shared with him this crazy idea. My son gave me his full blessing and support. The fact that I had been married and divorced prior to seminary is surprising to many people. But in my case, I was single, celibate and very active in the Church for 24 years before taking the step. There are many ways that God calls and prepares men for the priesthood. My path is not unprecedented, but rare. But I can say that the Lord has used my single-minded devotion to his Church and my son to prepare me for spiritual fatherhood. Sometimes God writes straight with crooked lines. Describe your parents, family and friends that have been important to your life. I’m so grateful for the gift of my family and friends. My son Jimmy has been and remains my greatest gift from the Lord. Through him, I learned to love in a selfless way. He is an artist with a studio at the GoggleWorks, with watercolor paintings that have been exhibited throughout the United States. His original painting of Divine Mercy adorns the sanctuary at St. Ignatius Loyola Church, Sinking Spring. His wedding there to his awesome wife, Abby, was one of the happiest days of my life. I was blessed with great parents. My mom, Theresa, is a retired nurse, who lives in Pittston. My dad, Cataldo “Sonny” Maria, was a special education teacher who passed away in 2005. The gift of faith passed through them, and my late grandparents, who remain a big part of me. Despite the distance, I spend time often with my older brother, Carl; my sister, Annette; and my brother-in-law Ed; and their family. Even after starting at seminary, my family remains a big part of my life. Throughout the years, the Lord has dropped great friends into my life, who have inspired me and nudged me in the right direction at key times. I stay in touch with friends from men’s groups at St. Ignatius, the Cursillo movement and pro-life work at Lifeline. My interests are religion and politics – topics that polite Americans are told to avoid! Beyond that, I follow Yankees baseball, Penn State college football and, most especially, the New York Jets. My fantasy football team is undefeated, but I don’t like to brag. Above all, I love to spend time with my family – my son, Jimmy, and daughter-in-law Abby in West Lawn; my mom; and my family upstate in Pittston – as well as my friends back home. Though each day is framed and permeated with prayer, seminary life is still very active and hectic at times. We have classes four days a week, with Thursdays dedicated to our weekly apostolate. I spend that day at St. Jane in Easton – which is awesome. We are off on Saturdays, so I typically spend the day visiting with my son and daughter-in-law in West Lawn, or my mom and family upstate. My regular seminary days begin in chapel around 6:30 a.m., with Morning Prayer and daily Mass. We have classes most of the day, with Evening Prayer at 5 p.m. In between, there is plenty of time for both profound and comical conversation with seminarian friends. 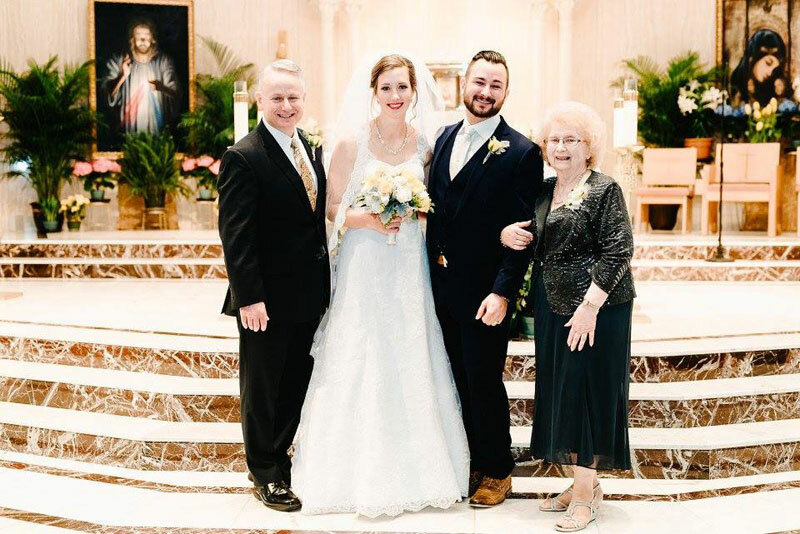 John Maria, left, seminarian for the Diocese of Allentown, enjoys his son’s wedding day with, from left: his daughter-in-law, Abby; his son, Jimmy; and his mother, Theresa.